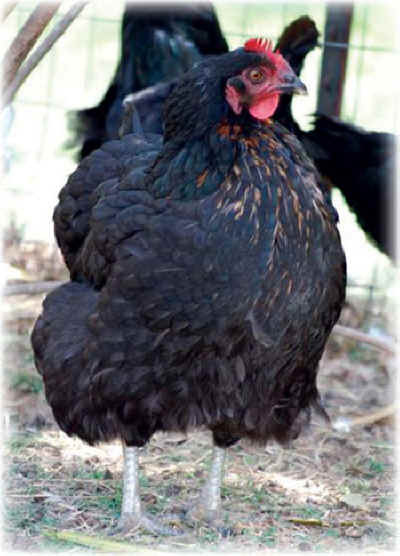 It was very early in the spring, so I decided to let Dahlia and Lena, two large and lovely coal black hens, sit on their eggs, thinking no eggs would hatch this early. Imagine my surprise when on a chilly April morning, Dahlia stepped out of the henhouse, proud and happy, with one tiny coal black and ocher yellow spotted chick at her side. Two days later, Lena emerged with her own little chick, and I watched Dahlia and Lena stride side by side through the soft, deep winter rye grass with their chicks hopping closely behind them. One morning soon after, Lena refused to leave her nest. When I gently pried open a spot under her warm feathers, I found her little one, still and lifeless. I left her alone with her baby, knowing she’d come out in her own time. Three days later, Lena joined Dahlia and her spotted chick; however, I noticed that each time Lena drew near the chick, Dahlia would call the youngster to her side and cover the chick with her feathers. A few days later, Lena, Dahlia and the baby were sitting under the large hackberry tree, when all of a sudden Lena began clucking motherly calls, and the youngster responded. Lena gathered Dahlia’s baby under herself, wiggled back and forth, and sat contentedly with her new “prize.” Dahlia was not pleased, but Lena persisted. Time and time again, she intruded on Dahlia and her baby. Each time she called, the chick responded, and each time this happened, Dahlia would coax the chick back to herself. All the other hens in the yard watched as the two hens battled over the baby, who meanwhile seemed quite content to have two caring mothers. It seemed the two hens had decided it was time to come to an understanding, and after several minutes of low clucks, chirps and cheeps, my eyes followed them as they stood up and started scratching together in the dark brown earth. 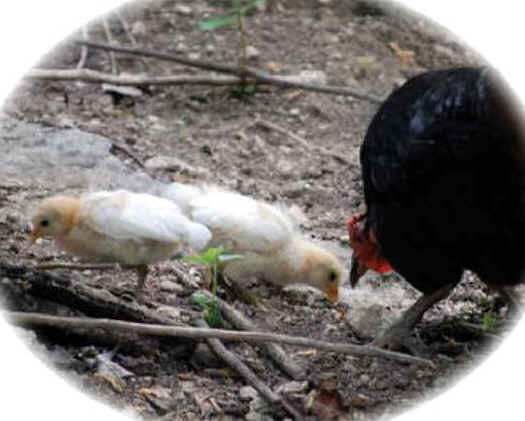 Only now, instead of bickering, the two mother hens encouraged their baby to eat the seeds they found there, then made their way about the yard, cooing and caring for their treasured little one. Over the next few days, the baby and her two loving mothers were inseparable. If a special delicacy was found, both mothers called the chick, waited for her to run to their side, then scratching and clucking in unison, they encouraged the little one to enjoy the treat. Any time a hawk flew overhead, the mothers were there, sitting on the chick and keeping her safe. Even now, weeks later, there isn’t a moment when the two mother hens and their privileged chick leave each other’s side. Theirs is a life of happiness and peace, which they have chosen to live as a family.